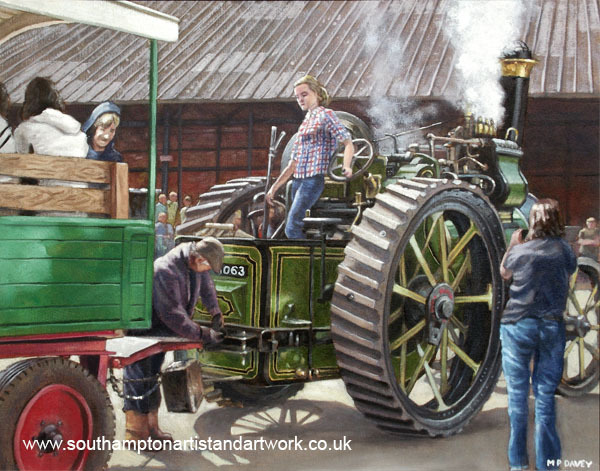 This is a 2nd painting of an open day at Bursledon Brickworks, Southampton UK . It is a heritage museum site, based in a old brickworks. This is a display of traction engines put on during April 2011. The engine featured is a Aveling and Porter traction engine (TA 1063). It was fun painting the shining brass, copper and the paintwork on the engines. The woman on the right photographing the engine was added later to add extra interest and scale to the scene, as was the boy in the trailer on the left. Getting the perspective correct in a scene like this is very important. It helps to sell the viewer of the painting the scale and weight of the machinery. Mechanical objects can not be cheated on when trying to ignore perspective, it has to be done right. Getting the ellipses right within a painting like this is very important. The painting is done in oils on a 16" x 20" canvas.